Heat oven to 400 degrees. Coat 12 muffin cups with cooking spray. 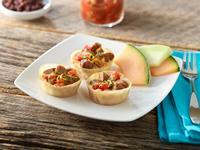 Place won ton skins in muffin cups. Cook the sausage as specified on the package. Always cook to well-done, 165 degrees, as measure by a meat thermometer. Place 2 sausage halves in each muffin cup. Top with 1 tablespoon salsa. Measure 3 tablespoons egg into each muffin cup. Bake 15 minutes or until eggs are set. Remove muffins from pan. Sprinkle each muffin with cheese. Top with olives and cilantro.